Marie-Chantal Claire Miller was born in London on September 17, 1968. She is the second daughter of Robert and Chantal Miller and like her older sister was also raised in Europe and Hong Kong. In 1993 Marie-Chantal met the man who was to be her future husband, HRH Crown Prince Pavlos of Greece at a party in New Orleans. They became engaged in January of 1995 while the couple were vacationing in Gstaad with their families. Their wedding on July 1, 1995 saw the gathering of the greatest number of Royals since the wedding of Princess Elisabeth(now Queen of England) and will forever be written in the pages of history. The couple who currently have homes in New York and Connecticut have three children: Maria Olympia(b.1996), Konstantine Alexios(b.1998) and Achileas Andreas(b.2000) and have often said that they would like to have more children. 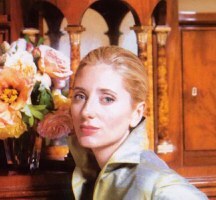 Today Marie-Chantal sits on various philanthropic organizations including, the New York School of American Ballet, the Animal Medical Center and she has also founded a charitable foundation for nature preservation. Also among her talents are writing and illustrating children's books and fashion design.